I dont have any issues with my connection in any way but I was just wondering why the latnecy increase for a short period of time during the night. It doesnt happen every night but I do see it happen on my line more than once. Could it be my ISP doing some monitoring/work on my line? Compared to most peoples graphs that looks like you never use the connection. The yellow spikes may just be you downloading something. 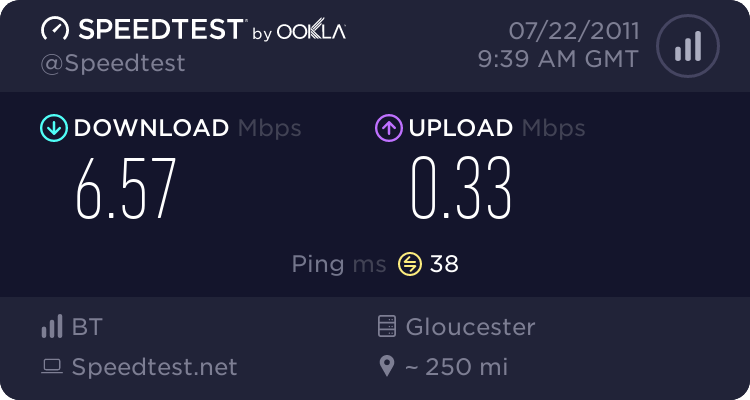 in my experience it is a routing change as my connection has had latency increases like that before. My misses and I actually use the connection quite a lot but it hardly affects the graph at all. When we download a movie etc I see a slight increase in the max latency but that is about it. My graph hardly changes no matter how I use/abuse the connection. On my live graph below you can see where I d/l a movie last noght at about 10:30 ish.